The architectural language of the U.S. District Court’s Missouri River Federal Courthouse in Great Falls, Mont., is formal and firmly grounded in historical precedence. The building materials and elements are compatible with both the style of today and the enduring context of historic design principles. 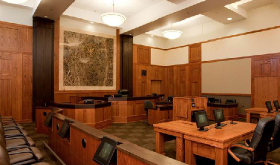 US Federal Properties (USFP)’s courthouse design and approach creates an environment that is truly open and inviting to the public, while remaining secure for the building’s users. The entry to the 60,000 square-foot courthouse was placed in such a way to be integrated with both access points to the site. 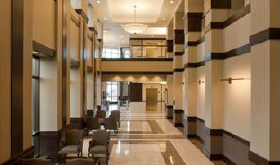 This project included an exciting, yet challenging, task to monitor the building’s size, while keeping all the magnificent architectural features and efficient layouts inside. USFP is committed to providing quality buildings to the General Services Administration (GSA) because we have the uncompromising belief that GSA deserves the best for its tenants. The courthouse groundbreaking occurred in August 2007, and construction was complete in June 2009. USFP continues to provide day-to-day property management.